﻿Birthdays come but once a year, and we celebrate them as though its the last! It heightens morale at the office! It leaves a good feeling in everyone! Heck, even when its your own, you cannot help but smile all day! This is wonderful- we all need happy feeling days! I used the Happiest Birthday Wishes set, for the sentiment. 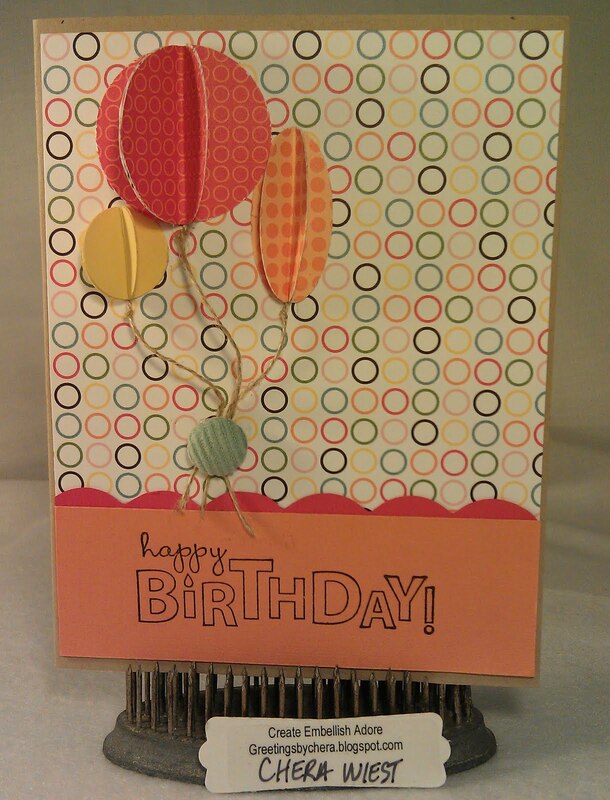 I punched circles and ovals for the balloons, using the Just Add Cake DSP. This was simple to put together and I wanted that. I added the brad to hold the balloon strings as an after effect. You do see alittle Tasteful Trims sticking up thru the Peach Parfait - in Poppy Parade (2011-2012 In Colors). ... NOW LETS EAT CAKE! What a happy cheery card Chera!! Love how you did the balloons - perfect against that circled paper too. Thank you for sharing!